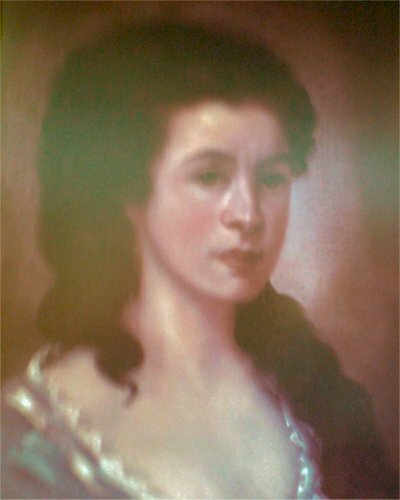 Martha Maria Stewart was born in Lurgan about 1755. In 1780 she married Rev. William Magee, a Presbyterian Minister of First Lurgan, who died in 1800 leaving her dependant on the Presbyterian Widow’s Fund. Her two sons died in early manhood, one from an accident and the other from rabies during service in the British Army in India. 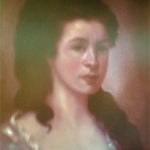 After inheriting a fortune from her two brothers, both military men, she moved to Dublin. 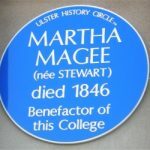 With other charitable bequests totalling £40,000, she left, in 1845, £20,000 to endow a college for the education of the Presbyterian ministry. 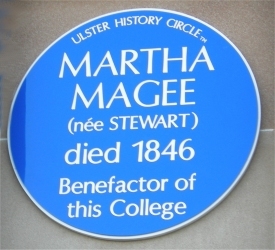 After prolonged controversy with the General Assembly, led by Henry Cooke, the trustees established Magee College, Londonderry, in 1865. 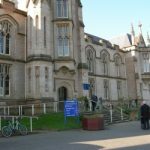 Despite the donor’s intentions the college accepted all denoninations from the start. 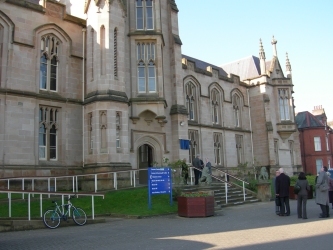 In 1970 it became an integral part of the New University of Ulster (now the University of Ulster). She died in Dublin on 22 June 1846.